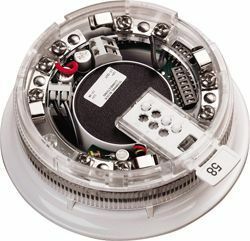 The Apollo 45681-393 is a loop powered combined sounder beacon base using the Apollo Discovery analogue addressable protocol. This device has an integral electronic sounder and flashing LED beacon all housed within one unit. The Apollo 45681-393 has 30 selectable tones with 15 evacuation and 15 alert tones. The Apollo 45681-393 is designed for use on panels compatible with the Apollo Discovery protocol. Examples of these panels are the C-Tec XFP, Kentec Syncro and Advanced Electronic ranges of control panels. One major advantage of the Apollo 45681-393 Combined Sounder Beacon base is that when it is used with the range of Apollo Discovery detectors it allows a detection, sounder and beacon point to be provided in one position in the room rather than installing 3 seperate devices. If you’re interested in the Apollo 45681-393 unit you might also be interested in the Apollo 55000-600 and Apollo 58000-600 detectors.